Mobility expert John Rossant and business journalist Stephen Baker look beyond the false promises of the past to examine the real future of transportation and the repercussions for the world’s cities, the global economy, the environment, and our individual lives. Human mobility, dominated for a century by cars and trucks, is facing a dramatic transformation. Over the next decade, new networked devices, from electric bikes to fleets of autonomous cars, will change the way we move. They will also disrupt major industries, from energy to cars, give birth to new mobility giants, and lead to a redesign of our cities. For Rossant and Baker, this represents the advance of the Information Revolution into the physical world. This will raise troubling questions about surveillance, privacy, the dangers from hackers and the loss of jobs. But it also promises startling efficiencies, which could turn our cities green and, perhaps, save our planet. In an engaging, deeply reported book, the authors travel to mobility hotspots, from Helsinki to Shanghai, to scout out this future. And they visit the companies putting it together. One, Divergent3d, is devising a system to manufacture cars with robots and 3D printers. PonyAI, a Chinese-Silicon Valley startup, builds autonomous software that perceives potholes, oncoming trucks, and wayward pedestrians, and guides the vehicle around them. Voom, an Airbus subsidiary, is racing with dozens of others to operate fleets of air taxis that fly by themselves. Hop, Skip, Go is about us: billions of people on the move. Underlying each stage of mobility, from foot to horse to cars and jets, are the mathematics of three fundamental variables: time, space and money. We measure each trip we take, whether to Kuala Lumpur or the corner drugstore. As the authors make clear, the coming mobility revolution will be no different. As they unveil the future, the authors explore how these changes might revamp our conception of global geography, the hours in our days, and where in the world we might be able to go. 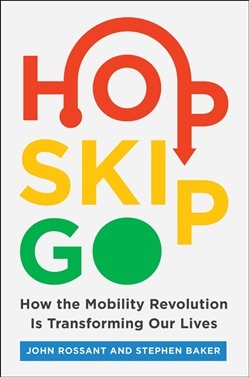 Acquista Hop, Skip, Go in Epub: dopo aver letto l’ebook Hop, Skip, Go di Stephen Baker, John Rossant ti invitiamo a lasciarci una Recensione qui sotto: sarà utile agli utenti che non abbiano ancora letto questo libro e che vogliano avere delle opinioni altrui. L’opinione su di un libro è molto soggettiva e per questo leggere eventuali recensioni negative non ci dovrà frenare dall’acquisto, anzi dovrà spingerci ad acquistare il libro in fretta per poter dire la nostra ed eventualmente smentire quanto commentato da altri, contribuendo ad arricchire più possibile i commenti e dare sempre più spunti di confronto al pubblico online.